At SIHH 2018, Cartier continues advanced new aesthetics in watchmaking. The combination of excelsior spirit and breakthrough innovations embodies two sides: One is the exquisite and delicate skeleton movement; the other is the light and mysterious movement. Skeleton and mystery clever collocation sets off the sense of beauty of the iconic movements and creates masterpieces with multiple processes. 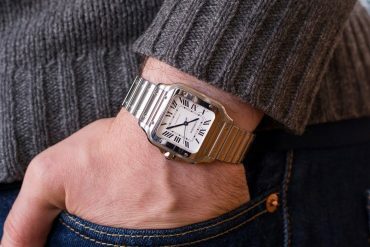 As a good model of Cartier watchmaking technology, the mysterious movement was born in 1912. 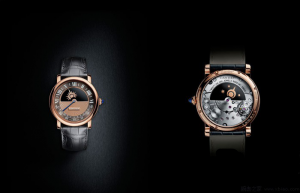 It’s the result of the joint efforts of Louis Cartier and Maurice Coüet (a great watchmaker) . Equipped with the mysterious movement, the first Cartier table clock was named Model A, whose inspiration came from Jean-Eugène Robert-Houdin, the father of modern magic. 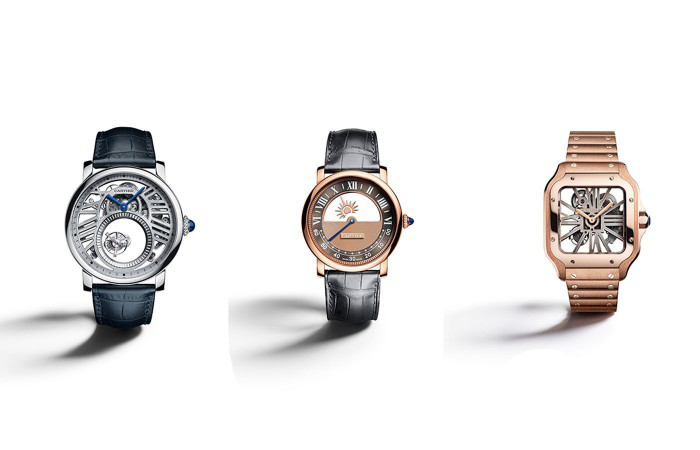 In honour of the classic mysterious movement, Cartier launched three new works in this tear: Rotonde de Cartier Mysterious Double Tourbillon, Rotonde de Cartier Mysterious Day & Night and Santos De Cartier Skeleton in pink gold. Rotonde de Cartier Mysterious Double Tourbillon fuses the features between the mysterious movement and the skeleton movement. The mysterious double tourbillon movement, Cal. 9465 MC was born in the Cartier workshop of La Chaux-de-Fonds. 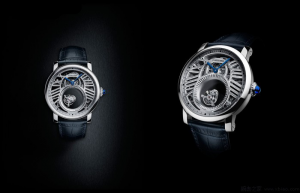 The tourbillon was designed according to a revolutionary dual floating design. As for the first frame, the tourbillon turn around by itself every 60 seconds. The second frame includes the whole mysterious part, and the tourbillon goes around every five minutes. Only superior craftsmanship can keep whole parts balance and satisfy the demands for the slim case. All parts were assembled together by hand and made the bevel edge, the wiredrawing and polishing for screw heads. Skeletonised Roman numeral bridges make the watch light, delicate and transparent. Rotonde de Cartier Mysterious Day & Night is equipped with the combination model of the mysterious movement and Day & Night display which both was born in 1912. The mysterious movement drives the sun rise and fall from the left to the right, while the moon displays the night time. Glyphs and satin sun-brushed pattern clever collocation brings out high readability. Santos de Cartier Skeleton watch deserves to be a classic work with an iconic style. Santos de Cartier has kept pace with new eras since 1904. The new Santos is equipped with a removable bracelet. With QuickSwitch, the bracelet helps wearers replace other straps or bracelets. As the other top tech, smart links help wearers adjust the length of the bracelet without any tools. Cartier skeleton craftsmanship was born in the 1930s. With skeleton Roman numeral bridges, Santos 100 watch which was launched in 2001 laid the foundation of the skeleton technology. 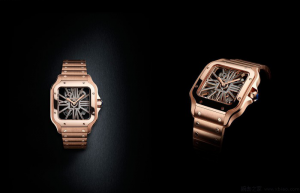 Because of the skeleton designs, Santos de Cartier Skeleton watch gives a deep impression on people. 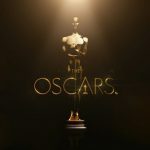 Cartier Treasure Witnessed the 90th Academy Awards!